You'll be £11.99 closer to your next £10.00 credit when you purchase Convicts in the Colonies. What's this? In the eighty years between 1787 and 1868 more than 160,000 men, women and children convicted of everything from picking pockets to murder were sentenced to be transported ‘beyond the seas’. These convicts were destined to serve out their sentences in the empire’s most remote colony: Australia. 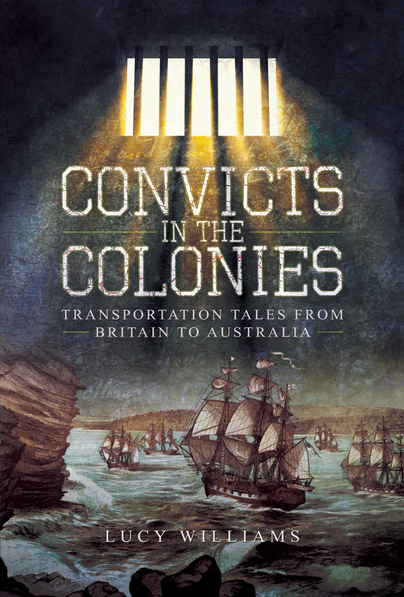 Through vivid real-life case studies and famous tales of the exceptional and extraordinary, Convicts in the Colonies narrates the history of convict transportation to Australia – from the first to the final fleet. Using the latest original research, Convicts in the Colonies reveals a fascinating century-long history of British convicts unlike any other. Covering everything from crime and sentencing in Britain and the perilous voyage to Australia, to life in each of the three main penal colonies – New South Wales, Van Diemen’s Land, and Western Australia – this book charts the lives and experiences of the men and women who crossed the world and underwent one of the most extraordinary punishment in history. I recommend the book to anyone wanting a general background in the convict experience. Those researching a convict ancestor will find the the inclusion of a guide to resources particularly helpful. Anyone with an interest in the development of Australia or the transportation of convicts can learn from this text and enjoy the up-close look at the individuals whose own words are used to describe what they saw and experienced. Many of the stories were horrific, while a few had happier endings. It really was a test of character and the ability to adapt under severe circumstances. Overall, an interesting read in a period of history which saw the development of the white man in Australia. This is undoubtedly a ‘sincere’ book, written to explain a complicated situation and doing it well. The author charts the journey of criminals from court to colony during the eighty years of transportation from Britain to the Australian colonies. The biographies she presents show the variety of causes for transportation, the conditions in which people were kept before and during transportation, and the different outcomes for transportees. Some did well in Australia becoming wealthy and well-known once they received their freedom, but most lived in obscurity, or were in and out of the penal system as they may have, had they stayed in Britain. I enjoyed this book and found the stories very affecting. I also enjoyed the detailed descriptions of life in prison, hulks, ships, penal colony and free life in colonial Australia. Lucy Williams is a writer and historian with a Ph.D from the University of Liverpool. She specialises in the history of Crime, Women and Gender, and the Social History of the nineteenth century. She has spent the last four years researching the history of convict transportation to Australia as part of the Digital Panopticon project. Her other publications include Wayward Women: Female Offending in Victorian England, and Criminal Women 1850-1920.